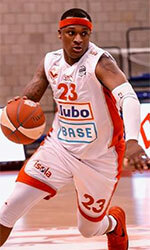 Al Sharjah (D1) tabbed 31-year old American guard Ricky Harris (187-80kg-87, college: Massachusetts). He played in the summer at Zoo Crew (TBT) in the U.S. The last season Harris played at Salta Basket (LigaA) in league where in 38 games he averaged impressive 16.1ppg, 1.8rpg and 3.0apg. 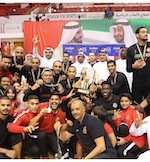 Rickey replaced the american guard Shane Rector who started the season with Al Sharjah. Ricky has tried to make it to the NBA and played in the NBA Pro Summer League in 2013. Harris' team made it to the German Bundesliga Semifinals in 2012. He is quite experienced player. Harris has played in seven different countries on three different continents (Europe, Latin America and of course North America). He has played previously professionally in Israel (Maccabi Rishon), Italy, Lithuania (Siauliai), Philippines, Turkey (Muglaorman and Ankara D.S.I. ), Ukraine and Germany (Gladiators and s Oliver Baskets). Harris attended University of Massachusetts until 2010 and it will be his ninth season as a professional player.